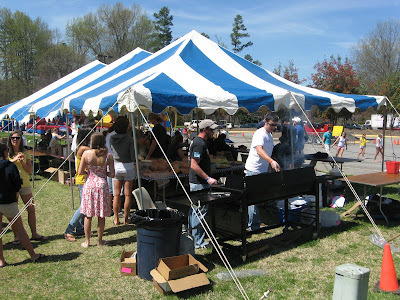 The Grill Tent is always central at Catawbapoolza at Catawba College, North Carolina. After all, you really can't have a good party without good food. The guys are busy grilling burgers and hot dogs. If you've strung a little tight with all the papers and exams as the college term winds down, then a good fun fight may be just the ticket. Place your bets on the winner. Talk about some extreme fun. Several of my students wanted me to give this ride a try. After a big North Carolina barbecue sandwich, I thought not. Actually, I thought not before the sandwich, but the barbecue made a really good excuse in this case. Swimmers just never get the glory, unless it Olympic time. Here are members of the swim team at Catawba College. My boys are swimmers too, so I say God Bless swimmers. I also say they sure eat more than you would expect. Throw on some extra burgers. They are also supposed to draw straws and send me a reporter from the team next year for newspaper. No. I wasn't kidding guys. This is how excited my public speaking students get whenever they see me. OK. Not really. They do come up with some great speeches though, and I'm proud of them. 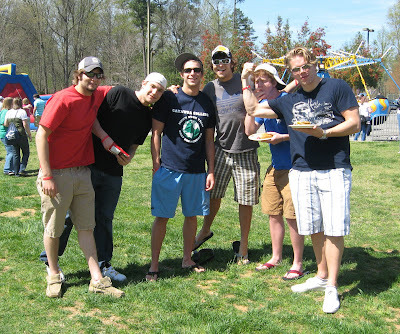 Today was our annual Catawbapoolza at Catawba College. It usually rains on the big spring party, so it was terrific that this year was sunny and warm. In fact, it felt like summer. That's always a great start to a day of grilled food and fun. The festivities kicked off about 2 p.m. following the Blue and White football game and an Open House for students thinking about attending Catawba College. The Girl Scouts also had an event going on, so it was a very busy Saturday on campus. I began the day at Open House but stuck around for Catawbapoolza. I've not missed a one since they started having them. That's been several years now. 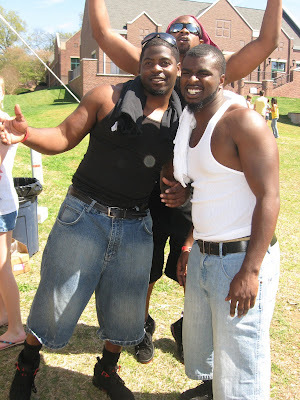 My boys always come with me, but this year my oldest is off at UNC Chapel Hill, and the younger one had a camping trip. I went kid-less, but that was fine. At a small college, I know most of our students, so I can bop around and visit with the college kids in a social setting for a change. Catawbapoolza is kind of like a small town carnival. 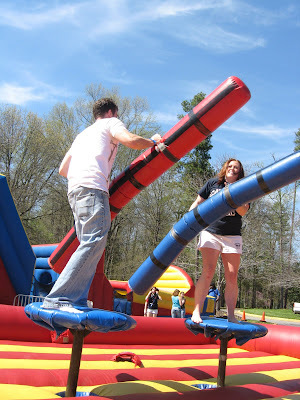 There are a variety of rides plus face painting and other fun activities. There's also plenty of food. In addition to the grill tent, they had pretzels, nacho chips, ice cream, and Frost Bites (a local favorite of shaved ice and various flavors) this year. Various groups on campus pull this big event together. Student Government plays a key role, but other clubs also pitch in. On my end, I always take pictures. I advise for the student newspaper. Student staff photographers also get photos of Catawbapoolza, but I enjoy taking some as well. We like to showcase Catawbapoolza in the final newspaper each year. Catawbapoolza was great this year. I need to be mowing my yard, but I think that can wait until tomorrow. Sometimes it's good to let your hair down and enjoy a beautiful day. This was a really nice one.